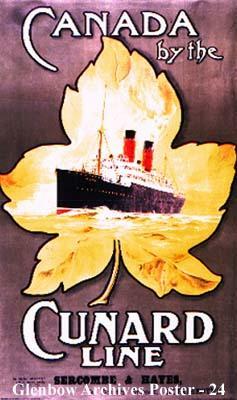 "Canada by the Cunard Line"
"Canada's Great Problem - Immigration. A Problem for the Church to Face and to Answer." 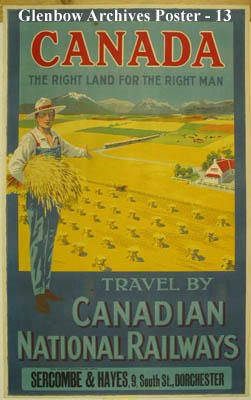 "Canada. A New Low Fare Available to all Settlers Irrespective of Occupation." "Second class passengers on board the Empress of Ireland." Postcard labeled "On the Trail to Grande Prairie, Alta" shows two wagons pulled by teams of oxen, the driver and a couple of horses. There is a note on the back from S. Crerar to her sister Mrs. George Therkley in 1913. "On the Way West". Smith Family on their way to a new homestead.